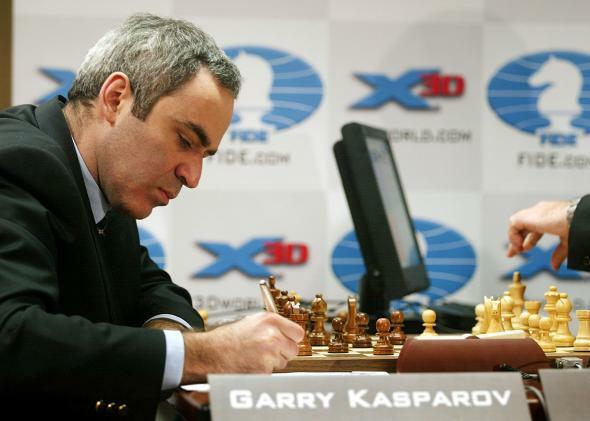 Garry Kasparov, Magnus Carlsen: Who is the greatest chess player? Chess grandmaster Garry Kasparov marks down a move during the final match against chess supercomputer Deep Junior in the the Man vs. Machine chess championship in 2003 in New York City. Player A scored 77 percent with white and 69 percent with black. Won the World Championship. Player B scored 67 percent with white and 68 percent with black. Won the World Championship. Player C scored 80 percent with white and 64 percent with black. Won the World Championship. Player D scored 72 percent with white and 63 percent with black. Won the World Championship. Player E scored 72 percent with white and 56 percent with black. Won the World Championship. You’d agree Player A and Player C jump out at you as the best, right? Player B is José Raúl Capablanca, Player D is Mikhail Botvinnik, and Player E is Anatoly Karpov. Player A and Player C? You probably guessed it. Bobby Fischer is Player A, and Garry Kasparov is Player C.
Case closed. It’s Garry Kasparov—unless some young Norwegian talent outdoes him. Chess: When will chess be completely solved? Chess Thinking Process: Does chess really improve thinking skills? Chess: What are the basic mistakes that if avoided would improve an amateur’s chess game significantly?